Two Wolff 6031.12 flattop trolley jib cranes are being used to erect eight of the 10 pylons being built for a bridge to close the gap in the national highway Bundesstraße 50 in Germany’s Mosul Valley. The Wolff 6031.12 flattop trolley jib cranes being used in Germany's Mosul Valley. One of the largest and most demanding construction sites in Germany, the bridge measures 1.7km long and 158 meters high — almost twice the height of the MCG’s light towers. Contractor Porr Deutschland has also commissioned Wolffkran to provide all services associated with the cranes during the estimated four years of operation on the site. The first assembly of the cranes, on foundation anchors and with 40m jibs each, demanded a great deal from the Wolff service technicians. "The steep, narrow, often poorly paved roads that stretch through the vineyard required a sophisticated logistical concept," says Wolffkran MD Andreas Kahl. Despite this the two 6031.12s were both assembled to their initial tower height within 10 hours. Since the two cranes are being used to erect eight pylons, each of them will have to be dismantled and re-erected three times. The cranes are currently in operation on the second pair of pylons. While one of the cranes has already reached its final height of 113.6m, the other one will shortly climb to a final height of 131.6m. Depending on the height of the pylons, the Wolff cranes will rise to a hook height of 163m and be tied to the pylons just three times — all in demanding, windy conditions. "Every assembly and climbing step requires the highest level of concentration and thorough preparation," Kahl says. "We are constantly faced with logistical and technical challenges during the entire construction period." Both cranes have a maximum lifting capacity of 12 tonnes, making them ideal for lifting heavy iron and concrete formwork components. Overall, the red giants will move 35,000 tonnes of concrete and 3,000 tonnes of iron. All crane operating data is transmitted in real-time to the Wolffkran Service Centre via the remote maintenance and diagnosis tool Wolff Link. This means that service staff can immediately take care of any maintenance work on the cranes, and keep delays on the construction site to an absolute minimum. 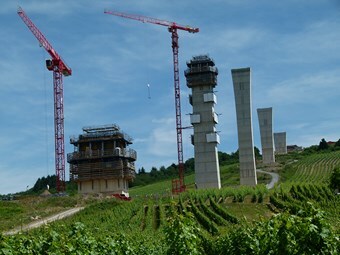 It is anticipated that the cranes will be in use at the High Mosel Bridge until the end of 2016. The bridge will be opened to traffic in 2018. 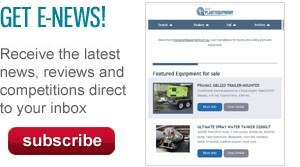 Click here to find cranes for sale.